We are extremely lucky to have so many amazing wedding venues in Devon that can cater for everyone’s tastes. There is everything from huge country houses, rustic barns, old farms, former warehouses, boutique hotels and rugged coastline. You’re sure to find something that meets what you need to have your dream day. I’m fortunate to have shot at many of the best wedding venues in Devon so I can share my experience with you to help plan your perfect wedding and make sure that your wedding is stress free. A place I know very well having got married at Huntsham Court myself in 2015. I have since been back to shoot weddings there and the place never fails to impress me. 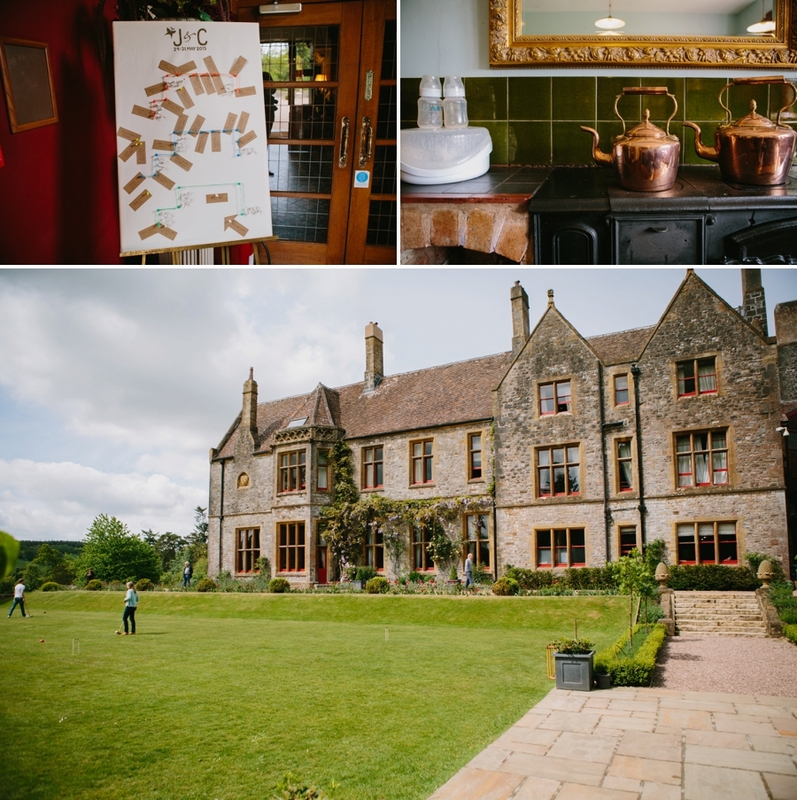 Hire the venue for a whole weekend and you have the flexibility to plan your wedding exactly how you want it, or you can take advantage of the brilliant team of planners there. The best thing about it is that you can have most, if not all, of your guests stay at the house as well. Naturally I think this is one of the best wedding venues in Devon. 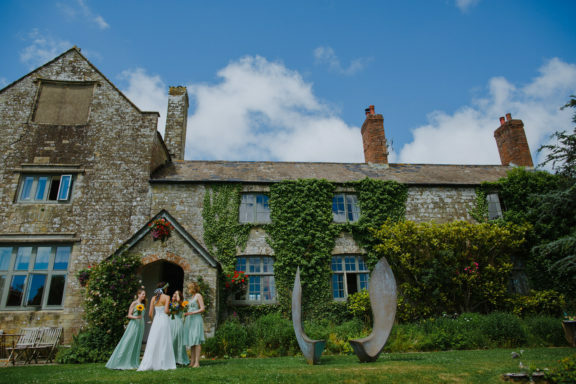 Hayne in Devon is a young and creative wedding venue set in the rolling hills of Mid-Devon. Including a 17th century Threshing Barn and 25 acres of glorious grounds and enchanting gardens, Hayne can also be hired out for 48 hours so that you can really make the most of your wedding celebrations. Positioned in Braunton near the amazing North Devon coast is Ash Barton is a big house with enough room for 11 families to hang out in. The rest of your guests can enjoy some glamping in the adjoining field and start the day with a swim in the pool. The house itself is only the beginning of the story as you can get married under a huge oak tree, explore the gardens and then party into the small hours in the barn. 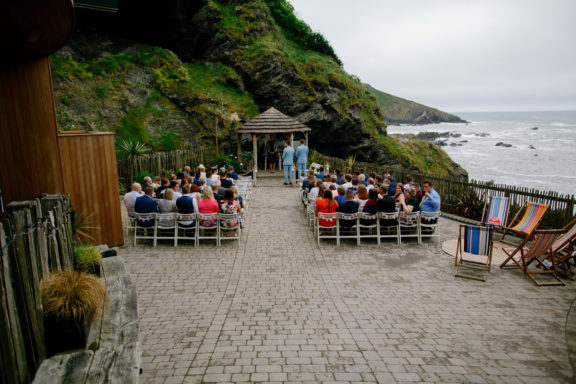 This is certainly one of my favourite outdoor wedding venues in Devon. This secluded Devon wedding venue is a hidden gem on the banks of a river in Dartmoor. It’s got 46 acres for you to play in and get creative with but if you need some help knowing where to start then Nicola and her team are on hand to do all they can to make your wedding as stress free as possible. If you’re a food lover then this is the place for your wedding. If you remember when Hugh Fearnley-Whittingstall burst onto the scene you’ll recognise the cosy kitchen from his TV shows along with the kitchen garden. Suited to intimate weddings as well as large scale events, you’re guaranteed a great location, tasty food and a treat for your guests as they’re taken from the car park to the house by tractor. I’m picking this as one of the best intimate wedding venues in Devon. Deer Park Country House is yet another award-winning wedding venue in Devon. It’s packed with them you see. Inspired by the best of British and celebrating the joys of country living, Deer Park is set in 80 acres of magnificent grounds, including an Italian walled garden and outdoor Mediterranean kitchen. The boutique manor house is an ideal venue if you’re looking for something elegant and sophisticated. 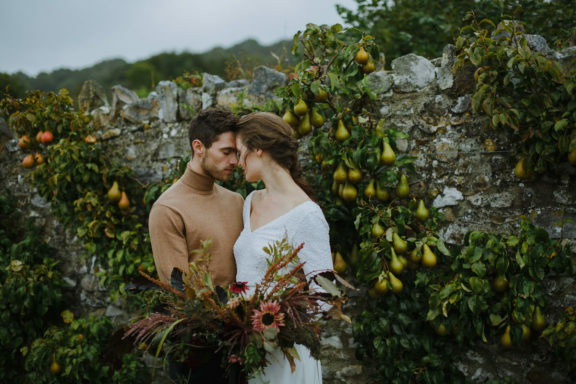 The home of Lord Ivar Mountbatten has been open as a wedding venue in Devon for a couple of years now and it’s already proving to be a big hit with couples not only in the south west but from all over the country. At your disposal is the house, an orangery, chapel, parkland and old stables. That should be plenty of room for you and your guests to have the mother of all parties to celebrate your wedding. The Tunnels Beaches in Ilfracombe is exactly how it sounds, a special venue and private beach only accessible via tunnels bored into huge cliffs on the North Devon coast. This venue is totally unique in that you can have your outdoor ceremony with a stunning backdrop as the waves lap the sand below you. Afterwards the purpose built structure inside the rocks houses your reception and party. Then watch the sun go down as you take a walk along the beach with your new husband or wife. Certainly one of the best coastal wedding venues in Devon. The Pig hotels across the country don’t actively advertise their wedding service as they are doing pretty well without them and they’re not licensed but if you’re planning a great meal for close family and friends or want a top notch venue to get ready at then The Pig at Coombe is exactly that place. You can hire the Victorian Kitchen for private dining for up to 14 people with a set menu, or if your feeling flush, book several tables in the impressive dining room in the main house. If you want to go alfresco then hire The Folly for some stone baked goodies with an outdoor/indoors vibe. This is about as unique as they come. have your ceremony outside and then celebrate with your guests in the gardens before spending the night in the most incredible tree house you have ever seen. The Treetops Treehouse is really a whole house in a tree and you will have the most incredible first night as a married couple here. If you would like to know more about having me as your photographer at any of the numerous wedding venues in Devon then please get in touch and we can start planning your day.